Webhuset Review 2019: Is Webhuset a Good Hosting? Webhuset is a Norway-based company that was established back in 1998. Initially started as a simple web hosting and domain name registration vendor, the company has over the years grown to become a full-fledged website hosting vendor hosting over 12,000 customers in Norway and beyond. Webhuset was founded in 1998 as a mere domain name registrar but has since expanded to become a full-fledged web hosting provider. It hosts all types of businesses: from SMEs to large corporations. Today, the hosting provider’s client base has surpassed the 12,000 mark and is still growing. Webhuset offers, among other services, shared web hosting, cloud servers, domain name registration, and SSL certificates. Its website is only available in Norwegian. Webhuset provides its web hosting, cloud servers, and website builder from its local data centers in Norway. The data centers are equipped with more than 6,000 servers offering scalable and extremely fast SSD storage. You also get full root and administration access for easier management and installation of the servers. With Webhuset shared hosting solution, you get a chance to choose from three web hosting packages: Home Office, Startup, and Ultimate web hosting plans. Home Office is for users who want to start with a single domain name, and comes with 100GB of storage. On the other hand, the Startup and Ultimate plans come with 500GB and 1000GB of storage respectively. They are both best suited for users who need more storage space. I was particularly impressed by Webhuset’s backup services because they are powered by industry-leading R1Soft server backup manager, which offers fast and reliable backup solutions. Though the backup services are not included as part of the vendor’s hosting packages, it has made them available to its customers as add-on packages at relatively low prices. Webhuset’s free SSL certificates are a big plus but it also offers EV-SSL certificate at a fee for clients who are looking for more advanced security features. 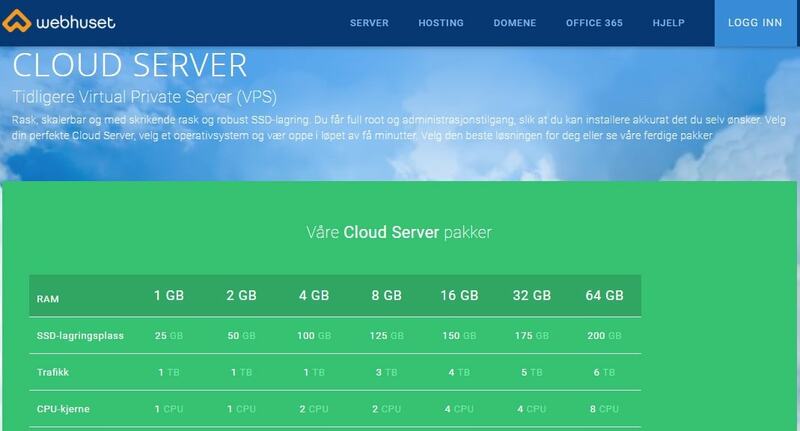 Webhuset’s hosting solutions are quite inexpensive and the prices are listed on its website in Norwegian krone. The vendor offers flexible, monthly billing cycles and its hosting plans often include discount coupons. Though Webhuset’s servers rarely have downtime, the vendor does not offer an uptime guarantee for its hosting solutions, but it does offer a 100% availability and uptime for its rack rental solutions. There is no money-back guarantee available either. 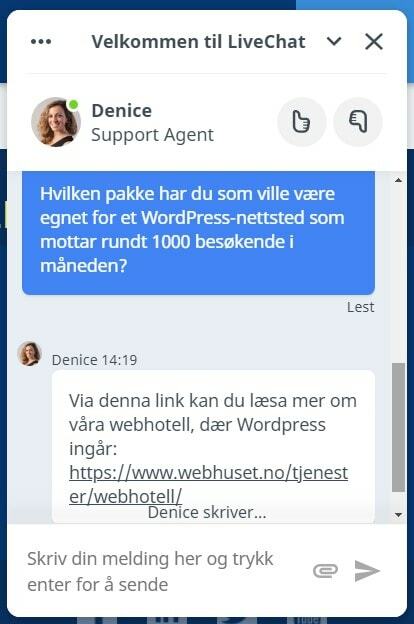 You can contact Webhuset’s 24/7 customer support team via live chat and telephone but not email or ticketing system. Customers in Norway can also visit their offices during business hours from 8:00 a.m. to 5:00 p.m. CET on weekdays. They have an excellent and commendable service with a fast response. I was quite impressed by how fast I was connected to a rep from the support team. The conversation that ensued was productive and the rep was courteous and friendly. What’s more, the vendor’s knowledge base is quite comprehensive. Webhuset hosting solutions have satisfied thousands of customers in Norway since 1998. The vendor’s experience in the web hosting space as well as its decision to invest in a working, professional, and courteous support team are some of the reasons why it has maintained a significant clientbase in Norway and other parts of Europe. Potential customers will be delighted to know that the vendor offers a wide range of hosting solutions that can handle an array of websites from anywhere across the globe. Wondering how Webhuset stacks up against other Web Hosting companies? Enter any other Web Hosting company and we will give you a side-by-side comparison.